CarGurus has 18,137 nationwide Versa listings starting at $2,000. Among the less expensive new 4-doors available today is the capable, if bland, 2014 Nissan Versa. Along with toting up to 5 folks in its surprisingly roomy cabin, this subcompact sedan offers almost 15 cubic feet of trunk space, with split-folding rear seatbacks in the higher trims adding even more schlepping acreage. Again this year, Nissan’s bare-bones little sedan comes in four trims, the base 1.6 S, the marginally sportier 1.6 S Plus, the upper-midlevel 1.6 SV and the flagship 1.6 SL. Keeping things simple, this year’s various Versa trims offer only some minor mechanical tweaks and slight feature upgrades. As is implied in the various trim monikers, a 1.6-liter variable-valve-timed inline 4-cylinder (I4) powerplant is the sole motivation choice in the Versa lineup. The four-banger is managed by one of 3 available transmissions, with the base 1.6 S carrying a standard 5-speed manual transmission or an available 4-speed automatic transmission. All other trims, meanwhile, again sport a continuously variable transmission (CVT). No matter the shifter, the I4 remains capable of 109 hp and 107 lb-ft of torque and, while estimated mileage once more depends on transmission selection, it nonetheless starts out pretty darn good and gets better from there. Look for 27 mpg city/36 highway with the 1.6 S’s standard stick shift, 26/35 with the available 4-speed automatic and 31/40 with the CVT found in higher trims. Oh, and this value-laden sedan is offered only with front-wheel drive (FWD). Although Nissan’s little sedan shows a lot of practicality and value, luxurious it’s not. The base 1.6 S, for example, sports 15-inch steel wheels, cloth upholstery, power-adjustable outside mirrors, tilt-wheel steering, air conditioning and a single-CD player with a pair of speakers. The 1.6 S Plus trim adds a rear spoiler, cruise control, a simulated alloy steering wheel and an additional pair of speakers, while the 1.6 SV tosses in premium cloth upholstery, full power accessories, a split-folding rear seatback and upgraded cabin accents. The top-shelf 1.6 SL, meantime, flaunts 16-inch alloy wheels, steering-wheel-mounted audio and cruise controls, upgraded audio with satellite radio, and Bluetooth hands-free calling. All lower Versa trims are, of course, eligible for a number of extras found standard on higher trims, including the upgraded audio and alloy wheels that can be added to the 1.6 SV. The flagship 1.6 SL, meantime, can be delivered with an available Technology Package that boasts the NissanConnect system and bundles together a navigation suite with 5.8-inch touchscreen with a rear-view camera, Pandora radio capability and Bluetooth streaming audio. Additionally, an auto-dimming rear-view mirror with remote garage door opener, carpeted floor and trunk mats, splash guards, illuminated kick plates, interior accent lighting and Nissan’s Vehicle Tracking and Recovery System are all trim-dependent options aboard this slick sedan. Finally, standard safety equipment across the 2014 Versa lineup includes 4-wheel antilock brakes (ABS), traction and stability control, front side-mounted airbags, and front and rear head airbags. The flagship 1.6 SL also sports standard front fog/driving lights that are available to the 1.6 SV, while the top-end trim additionally boasts a standard remote antitheft alarm. 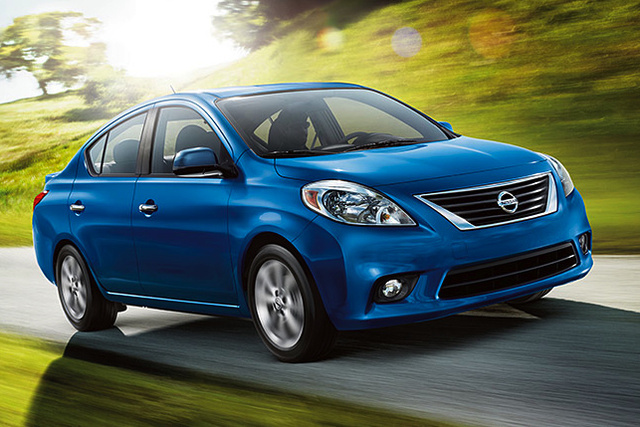 What's your take on the 2014 Nissan Versa? 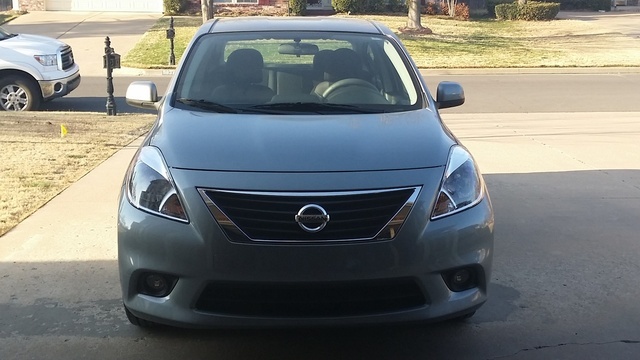 Users ranked 2014 Nissan Versa against other cars which they drove/owned. Each ranking was based on 9 categories. Here is the summary of top rankings. Have you driven a 2014 Nissan Versa? My car air conditioner runs fine and is cold as long as the car is in gear and moving otherwise it blows hot air. Why Does My '14 Versa NOte Get 39 MPG In Town And 34MPG On The Road?